Allow me to be upfront and say that I have never been an Indiana Jones-ophile and would call myself a moderate fan at best. After all, I was so young I could barely speak when the earlier films were released. Still, I always enjoyed watching them as a release into fantasy world. They acted as a more mature version of The Goonies which let your imagination escape into exploration. Indy represented that sort of more rugged James Bond character who was someone the girls loved and the guys wanted to be. 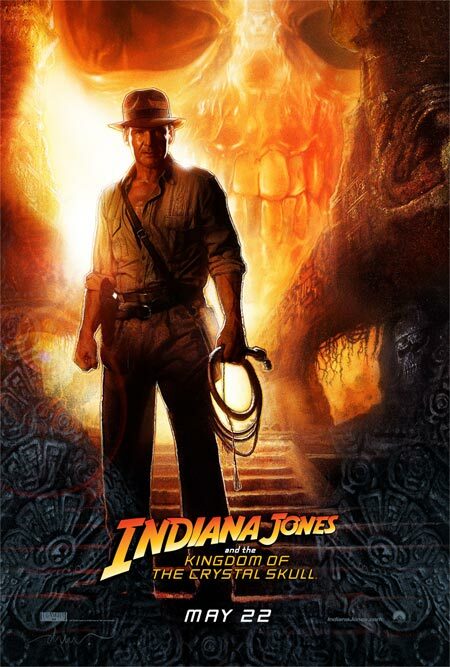 As a fairly pedestrian fan of the Indy franchise, it should hold a lot of weight when The Movie Mind says that Kingdom of the Crystal Skull was worth all the hype that preceded its release. It’s been way too long since I’ve seen a holiday blockbuster that did not disappoint in the least. Indy is back and this time the commies had better beware! I may not be able to recall much of the minutia from the earlier films, but from what I can recall, this newest edition epitomized what made the others so successful in the first place. There were incredible chase scenes and stunts, and Indy possessed the same wit and humor that endeared him to so many fans ages ago. Speilberg and Lucas addressed the long absence of the franchise right off the bat by letting Indy lightheartedly say to Mac (Ray Winstone), “That was a long time ago. We were a lot younger then.” By hitting the age concerns of the graying star head-on, they were effectively rendered nonexistent in my eyes. Sure Indy may have lost his quick first step, and his punches resemble a flailing Manute Bol right hook much more than an efficient Lennox Lewis jab, but it never was about the authenticity of the fighting with Indy. In fact, it was a nice reprieve to go back to those days of the A-Team when the good guy was invincible and could dodge a flurry of bullets and get away unscathed. You see with Indiana Jones, it was never about the violence or special effects; it was much more about creating an imaginary world where the hero never really was in danger, as bad as they tried to convince us he was. I have to admit I was quite impressed with the seemingly ageless Harrison Ford. He may have needed some more time in makeup to cover up those new wrinkles, but he certainly was as convincing as ever, playing the rugged doctor/digger. Maybe his believability has more to do with his character than the authenticity of the fight and action scenes. Whatever the reason, it makes it a whole lot easier to swallow the pill of Harrison Ford doing the things he does at that age in this Indy installment. The new faces also fit the bill perfectly. After being initially skeptical about Shia LaBeouf jumping aboard the Indy train as the suspected heir to this billion-dollar entity, I was pleasantly surprised at his performance. Hell, I may even watch the next edition when LaBeouf takes the reins and Ford is relegated to the role of Sean Connery. LaBeouf possesses the same innate wit and sarcasm as the old man while still managing to charm the pants off anyone he comes across. Cate Blanchett is also an intriguing villain and a formidable adversary for the good doctor. It was a nice casting job plugging her in here as the underhanded commie. Karen Allen made an effective return and neatly ties together some of the other new pieces. You may notice there isn’t a whole lot here about the plot itself. But what do you actually need to know that couldn’t be surmised from the previous films? Indy is better than ever, wiser with age, and the chase for the elusive “crystal skull” will pit them against some badass commies and into some devastating situations. As if you needed to know, Indy will take care of business as always and yet still manage to keep you on the edge of your seat. If that’s not enough to get you to the theater, then don’t bother. While it wouldn’t be true to form if I allowed this review to conclude without some kind of criticism, it is nothing more than nitpicking at best. But there is no way The Movie Mind will toe the line and bow at the feet of the Lucas and Spielberg thrones like all the other drones without some kind of parting verbal-wedgie. The film could have gotten by on even less CGI (Computer Generated Graphics), even though they did their best to stay true to its roots and use as many real stunts as possible. I guess there also could have been a little bit less “supernatural” and more reliance on the good old fashioned Commies…and how about letting me drink a soda from any fast food joint in the world without Indy’s mug glaring back at me? I think the results will show this will go down as one of the most financially successful films ever created. And in a startling turn of events in the Hollywood landscape, it will actually deserve to be. Interesting Cameo Appearance: Neil Flynn (aka “The Janitor” from the hilarious show, Scrubs) as Smith, a government agent who thinks Indy may be a commie. Mutt Williams: You know for an old man you ain’t bad in a fight. Mutt Williams: What are you, like 80? Mutt Williams: You’re a teacher? Agent Irina Spalko: You fight like a young man; eager to start and quick to finish. Indiana Jones: I have a bad feeling about this. Indiana Jones: Your name is Mutt? What kind of name is that? Mutt Williams: The kind I chose, you gotta problem with that? Agent Irina Spalko: No defiant last words, Dr. Jones? Indiana Jones: I like Ike. Indiana Jones: Their treasure wasn’t gold, it was knowledge. Knowledge was their treasure. Marion Ravenwood: You must have had plenty of relationships between the years. Indiana Jones: Yeah, they all had the same problem … they weren’t you. Indiana Jones: So what are you, some kind of… triple agent? Mac: Nah. I just lied about being a double. During that era noted as the fall of Man … which included almost a countless number of Pyramid shaped Manuel Power Facilities falling from their High Celestial places…. it was also during this time that many of these Ancient Pyramid objects showed themselves in their Gleaming Colorful and Light Weight Exotic materials as they seemed to just float in mid air in their downward decline and dis-placement. Several falling Pyramid Facilities lowered themselves and their attached Land-scrape from upper positions to settle richly flourishing soil atop the crust of Earth’s newly evolving surface. Other Facilities with their contaminated Power Facilities settled their Mystical Cities, or mobile and flying crafts in hidden areas throughout the planet and other distant places. Each of these power Facilities had to under go a purging process …..
As Exotic Structures of each Pyramid vanished from the surface of this planet, each left behind a ‘Molded Stone Image’ of the inner Pyramid’s overall Facility … and also it left behind the ‘Global Eyelet‘s Crystallized Mold’ with it’s center placed ‘Crystallized Skull’ … But these such true ‘Mystic Formation of the Skull’ would have been as the elements of a priceless jewel … For each such Global and Crystallized Mold which had formed there inside the Pyramid’s Eye-let, were in their later discovery, referred to as the Mother Load of diamonds … One such molded image has been referred to as King Solomon’s Mine. This might be something you would be interested in. As millions of people poured into movie theatres across the nation to watch the new Indiana Jones and the Kingdom of the Crystal Skull – many were left to wonder about the mystery behind crystal skulls. Did you know crystal skulls really exist in our history? Uncover what archaeologists and scientists have to say about these fascinating artifacts and the theories surrounding there creation only on NationalGeographic.com.